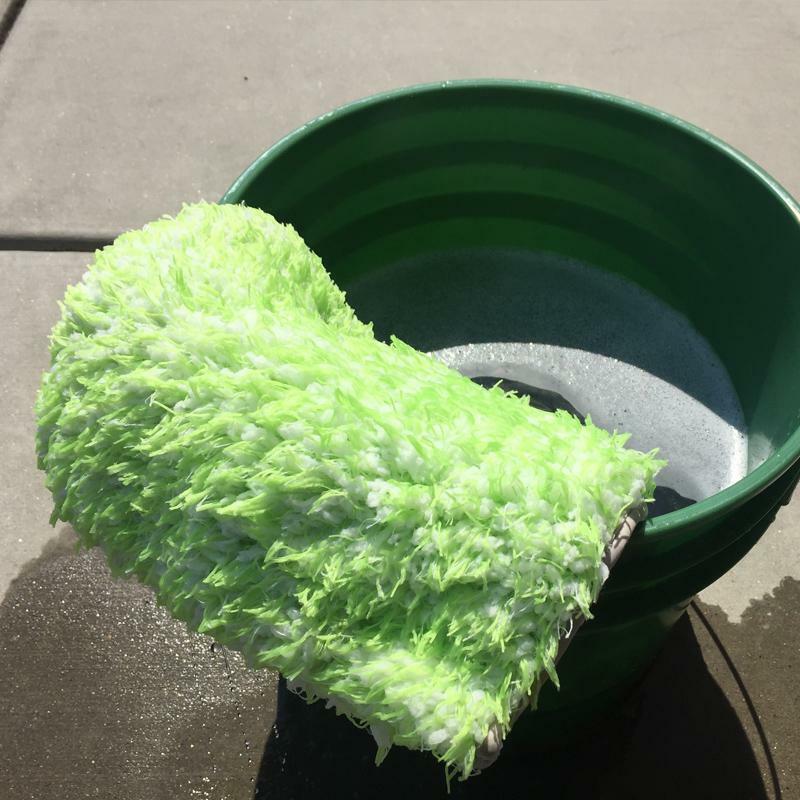 The DI Microfiber Green Monster Hybrid Car Wash Mitt is a uniquely designed wash mitt/pad that helps you wash safely and thoroughly! Wash media (pads, mitts, etc.) can sometimes be too stiff or too floppy when they are wet and may not contour around the unique edges of many vehicles. The Green Monster is manufactured to hit that happy medium, stiff enough to easily hold, yet bendable enough to wrap around contours with ease. This innovative design features different lengths and densities of fibers. The shorter, more dense, white fibers expand and hold the suds while the longer green fibers gently agitate dirt and grime on the surface of your car. This combo allows you to glide the Green Monster across the paint, pulling dirt and grime from the surface safely and easily. 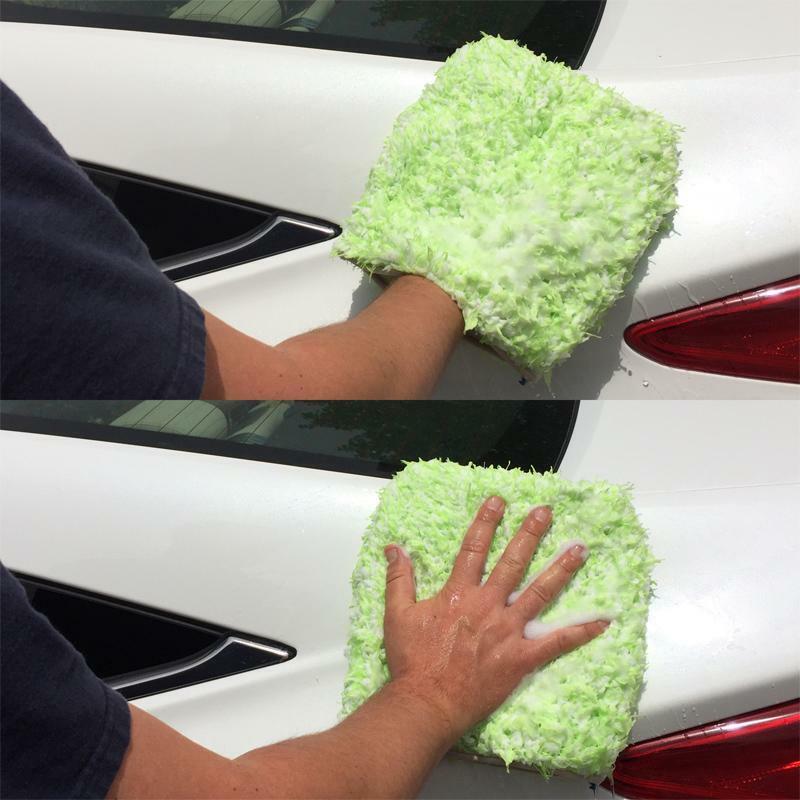 At 9" x 9", you can place the pad securely on your hand and use it as a wash mitt or place your hand directly on top of the Green Monster and use it as a wash pad and glide it along the vehicle's exterior ensuring that you apply the proper pressure for safe and effective washing. When you are finished washing your vehicle it is recommended to clean the mitt with a hose or pressure washer to remove any trapped dirt from the wash process as we recommend with all wash media. 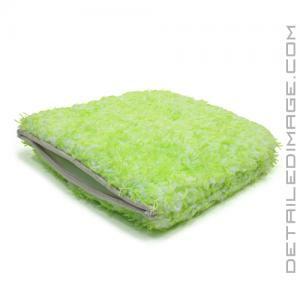 If you are looking for a high end wash pad that can also be used as a mitt, the DI Microfiber Green Monster Hybrid Car Wash Mitt is a great choice! NOTE: The pad comes out of the bag a little stiff. Get it wet, wring it out, and twist it a few times. This will help the pad loosen up for the perfect stiffness during washing. I love how I have the option to use it as a pad or mitt. I like wash pads more, and these are some quality pads. They are HUUUUUUUUUGGGGGGGGGGGEEEE - Donald Trump impression. Jokes aside, they are good size, quality microfiber, good construction and most importantly clean well. Buy a couple, you wont be disappointed. Wanted to add to my arsenal, and glad I did, found many purposes and ready to purchase another for a reserve. This is a very great and soft wash mitt/pad. It's very stiff when dry but once it gets wet it truly is the perfect softness. It's a great mitt/pad at a great price.